SUN VALLEY, Idaho –Olympian and world champion medalist Jonna Mendes has been appointed Director of Recruiting for the Sun Valley Ski Academy, it was announced by Steve Shafran, Executive Director of the Academy. Mendes’ selection supports the development of the newly created snow sport academy, which is a partnership of Community School and the Sun Valley Ski Education Foundation. The mission of the Academy is to provide an elevated level of athletic training combined with the excellent independent school education of Community School. Mendes, who has been working with U.S. 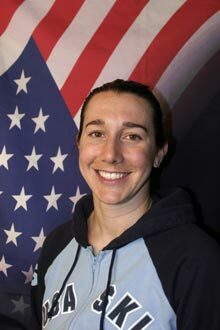 Ski Team’s national alpine development system (NDS) for the past four years, became a member of the U.S. Alpine Ski Team in 1996 when she was 16 years old and traveled the alpine World Cup circuit for a decade. She was named to the Olympic team for the Nagano (Japan) and Salt Lake City winter games and became a World Championship medalist in 2001 in St. Moritz, Switzerland. “We are fortunate to have someone of Jonna’s caliber coming to the Wood River Valley,” said Don Wiseman, Executive Director of the Sun Valley Ski Education Foundation. “Our coaches and program directors are excited to have her joining our team” he continued. “I am extremely excited about this unique opportunity with the Sun Valley Ski Academy. Since I left ski racing I’ve truly enjoyed working with young ski racers, and this will afford me the opportunity to continue to do that. The Academy will offer student-athletes the very best in both academics and athletics, which makes it something very special to be a part of. I am excited about bringing outstanding young skiers to Sun Valley and believe that it will be a rewarding experience for not only me, but more importantly, the SVSA students,” Mendes, who is 32, said. ”Jonna grew up in the Lake Tahoe area and did much of her competitive skiing in the west as a junior,” Shafran continued. “We believe the Academy will draw athletes from this region which is one she knows well. In addition, her experience with fundraising will be helpful so the Academy can provide financing for young student athletes from the Wood River Valley and elsewhere,” Shafran added. Mendes has played an important role working with the U.S. Ski and Snowboard Foundation, the ski team’s fundraising arm which generates over $5.5 million annually. Mendes will join Jessica Wasilewski, a graduate of the Community School and a past SVSEF Nordic athlete, who has been appointed the Director of Marketing for the Academy. Wasilewski is also responsible for creating and supervising the dormitory program for Academy students. The dorm is located in the old Bald Mountain Inn at the base of Warm Springs. Mendes, her husband, Will O’Toole and 14-month-old son, Declan, will move to the Wood River Valley in mid-October after participating in receptions for potential academy applicants in the San Francisco Bay area.